USFRA Advertsing and Sponsor Rates "advertising sponsorships", "sponsor boxes" links, classifieds, "business sponsors" "group advertising" "business logo"
The USFRA network is supported through the generosity of our website sponsors. Our sponsors are selected for being the top in their fields and all are friendly and ready to help out and answer questions when needed. Please support those who support us. Competitive Advantage - Gain access to USFRA's membership of fire/police chiefs and officers across the U.S. and around the world. Corporate partners can participate in USFRA conferences and leadership events. Networking Advantage - Develop and strengthen your professional relationships with the leading experts and key decision makers in the public safety services. 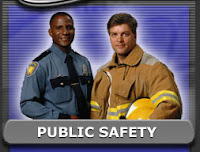 Marketing Advantage - Build your company's position within the public safety community. In addition to increased visibility among USFRA members, you benefit from being recognized as an USFRA supporter. Public Image Advantage - Establish and affirm your company's commitment to improving the public safety communities as a responsible corporate citizen that supports the mission of USFRA. All advertising are on a first come first serve basis. Platinum Business Listing $250/year includes business logo (main page, far left column, all member profiles, most pages on site, link in bi-weekly E-mail Blast) Space is limited. Law Enforcement Links Page: $75/yr. *The banners are provided by the client. Leaderboards are not available for sub pages. The USFRA E-Newsletter goes out to 51,000 in public safety, 1,500 FEMA professionals and 46,000 civilians with an approximate reach of 294,000 with email and social media shares. An advertising blog including pictures and links. Advertise your business or services in one or more of our specialty groups. FREE for job searchers. If you're looking for a job? Start your search here.If you are looking for a job and would like to place a free ad for prospective hiring managers, business owners and recruiters, click here. Please note: All advertising is reviewed before being accepted. USFRA reserves the right to refuse any submitted advertising requests and also reserves the right to publish a disclaimer that content of advertisement does not necessarily reflect USFRA's opinions. We use HTML-based text based links designed to block the ad blockers. When your ad is placed on any one of our pages it comes with a guarantee that your visitors will actually see it. Payment MUST be made prior to posting ad. Advertiser MUST proof all ads before submissions to insure correctness. Ad will be placed according to Advertiser's written, faxed or emailed wording only. Also said paperwork will be deemed as the contract of service between Advertiser and USFRA.org. USFRA.org administrators reserve the right to accept or reject an ad. Ads go live on USFRA.org as soon as payment and files are received and client notified. Refunds in full are granted providing the ad had not been placed or ran. Contact us here to place your ad.